Regular visitors to this site may be wondering if I’ve made any progress nudging my ‘untamed’ spouse towards less wasteful behavior. He’s not hugging any trees, but I do see signs of change. We now agree on some thermostat settings! Many of your comments on that post included great suggestions for nudging spouses, roommates and friends to be less wasteful. As I pointed out in my recent post on the Sustainable Brands website, companies are doing a lot to make their operations, goods and services more environmentally sustainable. But they also recognize the important role that we consumers play through how we use and dispose of products. In the SB article, I suggest that companies, along with government and nonprofit partners, can nudge consumers to be less wasteful and adopt greener behavior by taking a page from the social marketing playbook — make it easy, fun and popular. Do you agree? While recycling is still a chore, clear instructions, accessible bins, curbside pickup, and reverse vending machines at the supermarket make it more convenient for us to dispose of newspapers and commingles responsibly, and to redeem deposit bottles and cans. Recycling of other items like rechargeable batteries and fluorescent bulbs is more problematic, and requires us to do some research. I find www.Earth911.org is a helpful resource, but surely it could be made easier. I have a few burned out tubular and compact fluorescent bulbs stored in the pantry, awaiting a trip to my county MRF (Materials Recovery Facility). I shudder to think how many end up thrown in the trash, mercury and all, by consumers who lack the patience or storage space! One barrier to making it easy for consumers to be less wasteful may be a lack of simple skills to extend the life of possessions. Better to sew a torn seam or re-attach a button than to buy a whole new garment. In earlier times, children learned cooking, sewing, carpentry and repair skills in the home, supplemented by Home Economics and Shop classes. Are these taught anymore? Should businesses or local governments step in with helpful webinars? I miss the local hardware store where you could buy one screw to re-attach that ‘thingy’. I also miss repair shops for everything from shoes to lamps and vacuum cleaners that used to be in most neighborhoods. As another blogger discovered, some consumers are literally taking matters into their own hands by joining Fix-it Collectives and Repair Cafes. 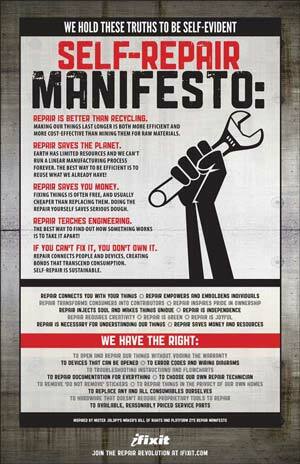 The image to the right is the ‘Self-Repair Manifesto’ from ifixit.com, a website that provides guides and manuals to empower and encourage consumers to fix their stuff before throwing it away. Companies are making it easier for us to be less wasteful via streamlined packaging, concentrated formulas, recycled and customizable products. Refillable products are great, but only if the refills are economical, uniform, and widely available. When was the last time you replaced a ballpoint refill instead of throwing the pen away? Some companies try to make it easier to responsibly dispose of products and packaging by developing better How2Recycle instruction labels for packages. Electronics, cell phones, and printer cartridges that come with return envelopes or cartons are helpful, as are drop-offs and take-back centers at stores like Staples and Best Buy. Of course, many nonprofit organizations like Goodwill have collection bins, drop-off centers and/or pickup service for unwanted furniture, clothing and house wares. Clothing retailers are making it easier to give away unwanted clothes and textiles to be recycled instead of ending up in landfills. For instance H&M has a garment collection and recycling program. The British company, Marks & Spencer is making it convenient to drop off unwanted clothing and ‘schwop’ for new duds on the same trip. Designer Eileen Fisher has closed the apparel consumption loop further by setting up Green Eileen outlets where consumers can buy gently worn EF clothing and attend workshops where they learn to create items using leftover fabric. Some of us derive pleasure from the sheer challenge of reducing as much waste as possible and forming new habits like remembering to bring cloth shopping bags to the store. Just as many companies are re-designing and re-imagining products and services, and bringing exciting eco-innovations to market, greener, more mindful consumers are finding a new creative outlet by figuring out inventive ways to use less energy, water, products, etc., and repurpose items that would otherwise be discarded. This collection of 50 creative ideas for purposing household items like toilet paper rolls, credit cards and old light bulbs from Twisted Sifter is fun and inspirational, as are the many postings on WeHateToWaste.com. Game-like activities, feedback and rewards, can also nudge us towards waste-reducing behavior while we’re having fun. Examples include Recyclebank and The Fun Theory. One game designer who believes in the power of play has created a card game aptly named ‘Waste Not’ to help unleash creativity in rethinking uses for common objects that may otherwise end up in the trash. As social animals, we consumers naturally want to do what’s ‘in’. But despite the obvious environmental, economic and social benefits, sustainable consumption is still not the norm in our society. In our disposable culture, wastefulness lacks the stigma of shame embodied in the Japanese concept of Mottainai. What will it take to make resource conservation more popular? Perhaps U.S. consumers will respond to a humorous campaign like this one that points out the ‘weirdness,’ not shame of — wasteful habits. 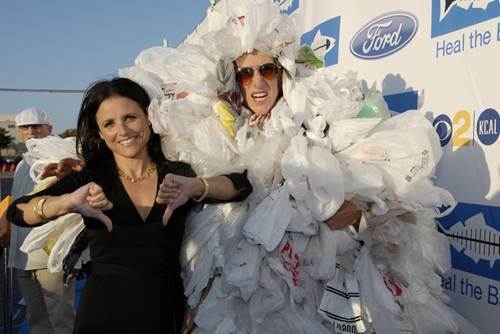 Policies like bans on plastic shopping bags can also nudge us consumers to be less wasteful. School and company policies that systematize efficiency can help, too. When my college shifted the photocopy center default to two-sided copying, and switched to online versions of many forms and documents, people quickly adjusted and felt good about it. 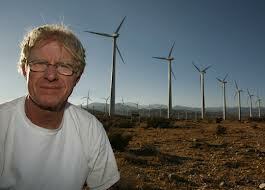 High-profile celebrities like Julia Louis-Dreyfus and Ed Begley Jr. make conservation cool. Television, movies, and social media play an important role in popularizing ideas, styles and behaviors. While watching the Learning Channel show ‘Four Weddings’ (a guilty pleasure) recently, I’ve been pleasantly surprised to hear more than one of the bridal competitors express regret over the wasteful mountains of food at the reception. Could similar opinions and green behavior become as common as product placement on our favorite scripted TV shows? 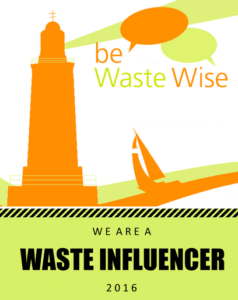 As waste prevention activities gradually become easier, more fun, and more popular, we waste-haters can help spread the word in our own circles of family, friends, neighbors and co-workers, with a creative, constructive tone, not a critical one. We can join like-minded citizens and consumers to create community, share ideas, and advocate for change, in person or online. As I stated in the SB article referenced above, that’s the premise behind this WeHateToWaste community and website. 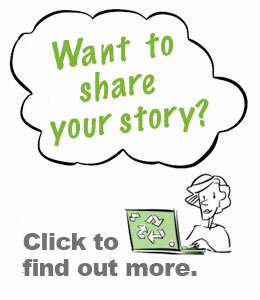 What Makes Waste Reduction Easy and Fun for You? How have companies helped the process? What else can they do and we consumers do to make it more fun, easy and popular to waste less? 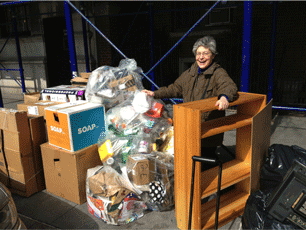 Give this NYC Recycling and Zero Waste Champion an Award! We recently got big blue recycling bins in Atlanta. The recycling is voluntary but virtually everyone kept theirs. I found the amount of waste vs. recycling I now generate to be amazing. Most is recycling. Generally, Georgia has plenty of landfill space, so its not like the northeast, where landfill prices are high. I guess the economics work now, probably because of the price of oil. I found the process makes me feel good, and I looked it up and recycling releases endorphins. I’ll take all I can get! However, the only thing I worry about is the water I use to rinse the items. Water here is very expensive and while this year we have a surplus of rain, we went through and I suspect will go through again, a severe shortage. I doubt the City has done a scientific calculation of this to see the total life cycle effect. Perhaps if they did I would go back to my old slogan for recycling here: dig a hole in Georgia and bury it. Great post. I think another policy that you could have added, is the tax or the fine. I know those words don’t resonate well with people but unless we find a way to include externalities like pollution and waste into the prices of things, it will remain difficult to alter consumer behaviors. The garbage tax, aka pay as you throw, is an interesting one, and it has been for the most part successful once implemented. A surcharge on plastic bags also, but a non negligible one, could be just as effective in reducing their use and might be politically more feasible than a complete ban. Great post, Fredrica. I do love the initiatives companies have been taking to mitigate waste, especially Staples and Best Buy. Electronics possess the most harmful chemicals such as lead, cadmium and mercury. If not discarded properly, these can poison our environment and threaten the health of individuals and communities. Raw materials have value and can be reused to manufacture new products. However, it is, It can be extremely labor intensive and expensive to extract the value of these materials from such devices. That’s why I praise Staples and Best Buy; two businesses that are easily found in most municipalities and handle these electronic devices. Many of us want to be responsible and less wasteful — when it’s convenient. If more local businesses create waste initiatives, communities will notice and hopefully transcend to people becoming less wasteful in their households. I love your article! It’s wonderful that there are so many new initiatives that make being less wasteful both easy and accessible. For me, being able to take my used electronics to Best Buy, as Khari mentioned, has definitely been a game changer. Also, old printing cartridges that used to go into the trash now go to Staples where I also get money back for them. And, if you have any electronic items that still work but you simply don’t use, Freecycle.com is a great website. Just list the item you want to get rid of and someone who needs it gets it. My go-to gadget to waste less is the electrical timer. I used to rush out in the morning, only to return home at night and realize I left a light or two on. But, ever since I got my timer, that hasn’t happened. It not only helps me not waste electricity, it helps not waste money! Companies should be making it easier! I think that there are so many little changes that can be made to help us consumers out! I did want to share my little secret though. I was lucky enough to take a tour of the local recycling center and while every center has different policies and rules, ours accepts plastic bags in the paper bin. I guess that’s how they get sorted in the end. If you track down your local recycling center and give them a call, you should be able to find out a little more (although it is a hassle). What a great article! There are so many little things that most people can do to reduce their global footprint without having to disrupt their normal lives. I am a huge fan of cash incentives to get people to recycle–when I was abroad and visiting Copenhagen I ran into a wonderful program that could easily be implemented in the US to help with plastic water bottle waste. Water bottles are pretty pricy in Copenhagen–which cuts down on purchases to start–but when you bring them back to the store where you bought them they give you some cash back, so really paying extra is like a built in safety deposit that ensures you come back and recycle! My alma mater–Dickinson College–started a similar program in our campus convenience store. The Center of Sustainability collaborated with the college to create and extra $1 tax on plastic water bottle bottles sold in the campus store. Making a $.55 water bottle $1.55 really makes you think before you buy a disposable bottle, especially if you’re a broke college student. Additionally, the extra dollar from each plastic bottle purchased gets donated to the Center of Sustainability to help fund other campus initiatives. Everybody wins! Make it easy, fun, and popular. This simple outlook is reflected by our ever-moving, hard working, and busy society. Most of our habits are simply based on their convenience to us. Consumers are in need of these types of sustainable options where they can see that not only are they doing something morally, socially, and environmentally good, but that their hectic lives are made simpler as well. The idea of companies making it easy for people to be less wasteful is highly underutilized. Advertisements are everywhere we look and it is obvious that companies influence our consumption habits. Not only can they make it simple for consumers to recycle their waste, but they can lead by example and invest their time and money into sustainable waste removal or reuse therefore showing their commitment to something they claim is important and bringing public attention to the issue of waste management and reduction from a popular and well-trusted company. In regards to policy as a solution to wastefulness, many EU countries have implemented a charge per plastic bag used in stores. This decreases the number of plastic-based materials in landfills, increases the number of reusable bags being used, and gives the public a measurable sense of accountability for their wasteful actions. Reusable bags are a cheap, easy and responsible waste management technique that has the potential to save millions of plastic bags from being dumped into landfills each year. With so much emphasis on education as the building block of society, it is surprising that environmental ethics aren’t taught in more schools beginning in elementary school. Activities and programs where children learn the importance of the basics like the three R’s can be essential. There is a marketing approach that highlights children as a key demographic who control the consumer habits of their parents. Not only can children can teach their families the lessons they’ve learned in school and influence the actions of their parents, they are adopting values that they will hold with them their entire lives. creating social norms takes time and with some patience, increased awareness, and accountability this convenience centered society will be one that is proud of their hard work and social responsibility. Looks easy to use, and attractive enough to make the neighbors jealous. Now all we need is some sound effects to make it fun as well! Awesome post!! Fredrica, you pointed out some great things that companies and people are doing to cut back on waste. It makes me so happy to see the things that are being done now, but I do believe there is still a long way to go (as with most things). Recycling, for instance, won’t be more common until it is easy for people everywhere to do. No matter how hard I try to convert my grandmother, she will unfortunately never recycle because it is too much for her to personally take recyclables to a facility (there is no pick-up in her town). If people could do it more easily, I’m sure everyone would gladly recycle. I also agree with Allison about the importance of adding environmental curriculum into schools at an earlier age. The earth is rapidly changing because of how we are directly and indirectly treating it, and our children and grandchildren are the people who will be inheriting this planet. It is important to teach them how to care for the earth so that they won’t grow up blind to the issues that currently exist with the way we treat it. The children will take what they learn in school back to their families, and the “go green” message will begin to spread to everyone who otherwise would have never heard it. I see this already beginning, as people my age are attending school for environmental degrees are coming home and having conversations with friends and family about what is being done and what we can all do to be greener. Education is not the be-all, end-all solution to our environmental issues, but it is an excellent place to start! Hi Frerica, you’re absolutely right- we need to make home waste reduction easy and fun, because not many people see it that way. I was doing a project on food waste reduction earlier this year and couldn’t believe it when I found out that from a kerbside rubbish audit in my local council area, that nearly 20% of garbage can content was made up of recyclables. Organics made up close to 50%, with more than 40% of this being food. Therefore nearly three quarters of waste going to landfill could be recovered. It blew my mind to think just how much of an incredible difference could be made just from making more effort to separate recyclables and organics from landfill trash. This is where tools like games such as Recyclebank and policies such as payments for donating compost could be so powerful. I find food waste of all the evils..especially because of all the energy, water, fertilizers etc. that go into making the food. Even with all good intentions to cook, and with food prices still being relatively cheap (not to mention over abundant) in USA, it’s easy to find ourselves with food rotting in the fridge-both cooked and uncooked. tools such as fenugreen (http://www.fenugreen.com/) really work in elongating the shelf life of vegetables. I have tried it out and confirm it’s worth purchasing. Great post!! I really relate to the beginning portion about trying to convince others to reduce waste. I am constantly being surrounded by people who are either too lazy or just don’t care enough to take these efforts. I recently read an article (attached below) about a store that just opened in Williamsburg. This store encourages people and companies to be less wasteful by decreasing the amount of packages needed! I completely agree with this post, why throw away something that can so easily be fixed? I love how applicable this article is to everyone’s everyday life! I was especially intrigued by your section about policies. I think that creating policies like the one you described that defaults printers to double-sided would make a huge difference in our consumption as a society. These kinds of policies are important because they focus on prevention rather than mitigation. Using less paper will always be better for the environment than recycling used paper.